You are here: Home / Uncategorized / Why are you Afraid of Social Networking? Why are you Afraid of Social Networking? 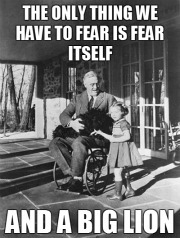 The above is a quote taken direct from Franklin Delano Roosevelt during his Inaugural address upon his election in 1932. Of course the US (world) were in the throws of the Great Depression and he was trying to get his country fired up for the next 4 years of his presidency. Ok so why did I start off with a quote of this caliber? Well…the biggest obstacle I think a lot of REALTORS® have to overcome when it comes to getting involved with Social Media is Fear. Fear of the unknown…”What if no one “friends” me on Facebook? !” or “What if no one follows me on Twitter?” or even “Who is going to watch my Videos? !” These are all statements of fear. People do not want to take action because they fear the unknown, and as a result it is holding them back from increasing their connections, relationships and overall their business. Below I have interviewed one of Canada’s premier Social Media advocates and a lady with a Big reach…Teri Conrad Lansing. Teri is a REALTOR®, and good friend and also the Senior Social Strategist with Socialized. We talked a lot in this video about how to overcome those obstacles stated above and Teri even shared with us 3 ways in how to get started in the social media/real estate space. If you liked this post I hope that you would consider sharing it with your connections and colleagues. All of Teri’s contact information is at the end of the video if you would like to connect with her! Thank You for checking out the video below! Kelley has consistently been in the top 5% in sales since he started full time in the real estate industry in 2008. He went through a major shift in his marketing plan at the end of 2009, recognizing the trend, and making the move towards digital marketing including websites, video, blogging and social media. Kelley is incredibly passionate about the use of technology and social media in his business and is often sought out for advice from other Agents from across North America. Kelley’s primary websites are: http://nwcalgaryliving.com and http://kelleyskar.com. To connect with Kelley through Social Media follow him on twitter.com/kelleyskar and on Facebook.com/kelleyskar. If you have questions or comments you can reach Kelley direct at [email protected].